In this week’s episode of our Hip-Hop Podcast, Audible Treats showcases the most recent songs from our artists. 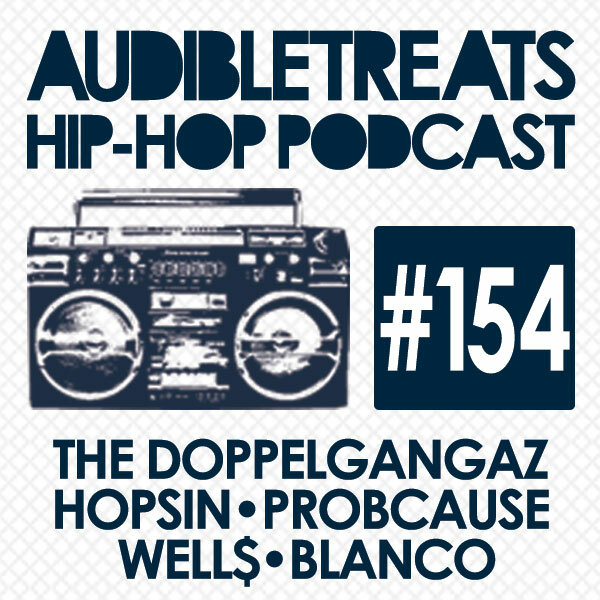 Starting the episode off is the gritty, rugged duo that is The Doppelgangaz. Their track, “Live Rugged,” displays their old-school sound combined with witty, amusing lyrics. The two echo, “I live rugged, do what I want, do what I want / ’till I kick the bucket.” Next up we have young Charlotte rapper Well$ with his track, “Lil’ Tommy.” With incredible flow and delivery, he tells the story of a bold and highly unstable, troubled high school student with dreams of exacting revenge on the people who hurt him. Following him is Blanco, The Jacka, & Messy Marv with their song “9/11.” Featuring YG, they take turns spitting hard over funky guitars, a fat bass, and killer percussion. After Blanco we have Chicago rapper ProbCause with his stellar track “LSD,” featuring fellow windy-city rapper Chance The Rapper. Remixed by The Hood Internet, “LSD” is off ProbCause’s forthcoming EP, WAVES. Rounding out our podcast is Hopsin, the powerhouse behind the indie success Funk Volume. His track, “I Need Help,” is from his Knock Madness album. He has recently released an insane, demented video for “I Need Help,” further showing that he is an artist who regards visuals just as highly as his music. Stay tuned for our next podcast.